Coins released in circulation aren’t just metallic pieces used for transactions; these are items with compelling stories as well. Just take the case of the three-cent silver pieces released in the United States from 1865-73. These coins have stories to tell, and collectors interested in numismatics will definitely love the background of these coins while exploring the United States coin history. The idea to issue this coin started in 1851, due to decrease of postage rates to three cents, and the collective requirement to issue coins that are available in smaller denominations. The result was the design and the issuance of the US three-cent coins, available in silver and nickel materials. 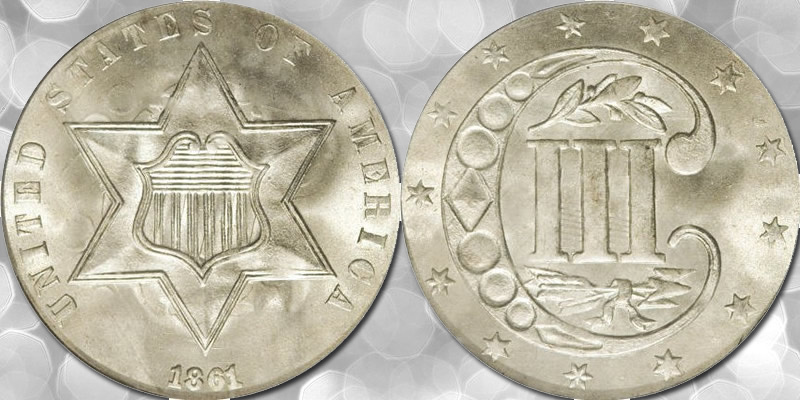 At the start of production, the coins were primarily made from silver (about 75 percent), and was considered during its time as the lightest coins available for circulation. Also known as ‘fish scales’, these coins include the six sided star and Roman numeral III. In 1854, the silver content has been increased to 90 percent, and weight was reduced. The overall design of the coins also received an overhaul, with the inclusion of arrows just below the numeral, the olive sprig and two lines used as borders for the star. Through the years, there were design changes made on the coins, including the overall size of the numerals. In fact it was during 1860-63 when the numismatics community saw smallest size for the numerals in a coin used in circulation. The coins were also minted in different locations starting 1851. It was in 1851 when the New Orleans Mint struck some of the coins, and the Philadelphia Mint also took the job of minting the coins from 1851 to 1873. Production also started to slow down, and in 1873, the coin-collecting community only saw the minting of the proof state of the US three-cent silver pieces, effectively pushing the prices to at least $400. While the community saw a surge in prices, there were coins that are still available at lower prices, including coins that were minted pre-1862. These coins were officially taken out of circulation due to Coinage Act of 1873. And during Civil war, the country saw a shortage in silver coins, and as a result a number of steps were taken. In the end, the Treasury Department invested in fractional currency. But this solution was problematic thus; the minting of the three cent nickel US coins was seen as an alternative. The coin was relatively larger than the previous silver coins, and made from nickel and copper. The coins also carried the Roman numeral III and the Liberty head on the other side. The production of these coins started to slow down in 1879s, and was officially stopped in 1881.